Happy Sunday, all! Today on the blog I am proud to be hosting JT Gillett, author of Orphans, Assassins, and the Existential Eggplant (Isn't that a great title?!) during his blog tour with HF Virtual Book Tours! Read all about the novel and enter to win a copy of the book! What's with The Existential Eggplant? As the story unfolds, we learn that when this eggplant was fresh, it was extremely edible and probably quite delicious if anyone had been foolish enough to eat it. But unlike other vegetables, this amazing eggplant was preserved to last forever. An old woman in the Arabian Desert grew the eggplant almost 600 years before our story begins. She was a midwife who people chased from villages every time a baby died and one day she was tired of being chased so she moved to the desert, where she lived alone, grew a sparse crop of vegetables each year and raised a few goats. She lived quietly until a thief burst into her hut one night and demanded jewelry he thought was hidden in her tent. When she explained she had nothing but two eggplants and three goats, the thief killed her goats and threatened to kill her if she didn’t give him her jewelry. But before the thief could raise his knife, an archer shot a single arrow into the tent and killed the thief. The eggplant had a higher stake than most when it came to existence. As far as it was concerned, its self-awareness was all the proof of existence it needed. It had memories and was quite aware of how others felt about it—even if they had no feelings about the vegetable. But the eggplant also understood it needed others to offer credible reassurance from time to time, otherwise it could never be 100% sure if it did exist, or if it was the imaginary product of a few humans giving the little vegetable make-believe qualities, like a human consciousness. There are several other existential scenarios the eggplant routinely considers, but none of them provide any certainty, so it continues to think of itself as a real being who can observe and interpret the world and is recognized as an independent consciousness by at least one human at a time. Unlike the Non-existent Knight, the eggplant needed no official papers to exist. In addition to the eggplant, Orphans, Assassins and the Existential Eggplant includes a host of quirky historic and fictional characters who take readers on wild, cross-continental adventure in search of the fabled Lost Stone of Eden. There’s Layla the wise alchemist, Mina the devoted desert saint, Aaron the teenage language prodigy, Stephen who led the Children’s Crusade, Hassan i Sabbah and his Assassins, the aforementioned Non-existent Knight, and many others. 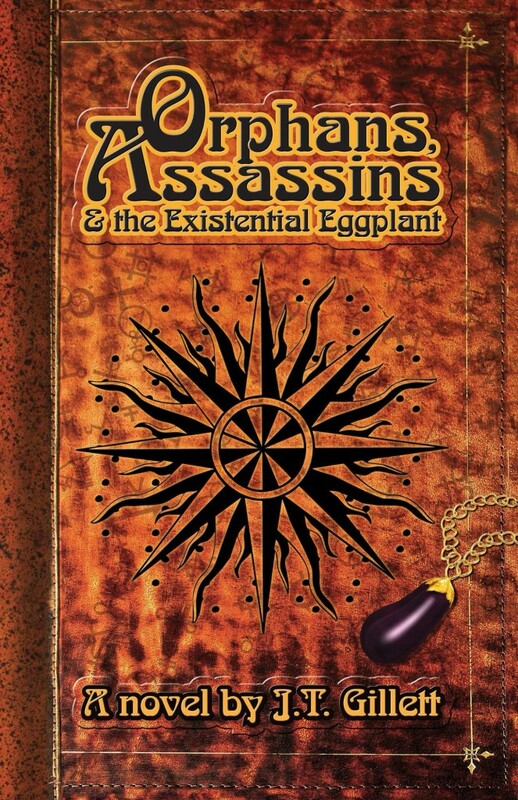 Orphans, Assassins and the Existential Eggplant explores the quirky side of historical fiction. The novel takes you on wild ride through the early 13th century with a female alchemist, orphan teenager and a 600-year-old, shrunken eggplant that can speak to whomever wears it. In search of the fabled Lost Stone of Eden, they cross Europe and the Mediterranean with the Children’s Crusade, hijack a caravan in the Sahara desert, live with hashish-fueled Assassins in the mountains of Persia and rediscover paradise on the island of Bahrain. Aaron and the girls slept for a few hours during the hottest part of the day, then rode through the evening and the entire night, taking only a few breaks to rest the camels. They didn’t catch up to any slow-moving caravans, come upon an oasis or see fires in the night. Everything around them seemed the same, day after day. Same mirrored sky. Same scorching sun. Same sound of camel farting and plodding. Same sad, ivory scent of emptiness. “Are we dead?” asked Donatelle as they shared the last of the water. They were sitting atop a tall dune and could see nothing but more dunes in every direction. “Do you feel dead?” Aaron had to ask, knowing that in the middle of this terminal landscape, it was a good question. “I can’t tell because I don’t know what it’s like to be dead, but it might be like this. Just nothing,” Donatelle shrugged. “Death is much different—and much luckier,” guessed the eggplant. Something took the form of a humming dark cloud on the horizon. They watched as it grew darker, stretched across the dunes and started to roar like steady, rolling thunder. "Good stories rise and fall like empires in the endless pursuit of happiness, like armies of lovers marching to paradise - good stories change the world." So begins Part One of Orphans, Assassins and the Existential Eggplant. This book is such a good read. I read it on the plane to Hawaii, and it soared with me through the sky. My wife kept asking what was so funny as I giggled and laughed in my seat. This story changed me, in that flying is such a drag these days, and this book kept coming up with surprises, weaving together stories of gods, goddesses, orphans and assassins, the pursuit of the unattainable, and existential conundrums. I have had the opportunity to read some of Mr. Gillett's poetry (especially "This is My Last Poem" - I hope this is not his last novel), and in this novel, he brings his poetic ability to sublimely transport the reader to new views of the mundane, new opportunities for transformation, and new ways of understanding my own self. What more could I ask for in a book. J.T Gillett holds degrees in philosophy and journalism from the University of Oregon and studied at Naropa Institute’s Jack Kerouac School of Disembodied Poetics. His stories and poems have appeared in a variety of Literary Journals, including City Lights Journal, edited by Lawrence Ferlinghetti. For more information please visit the Orphans and Assassins website and blog. To enter to win a copy of Orphans, Assassins, and the Existential Eggplant by JT Gillett, please leave a comment below, with your email address. – Giveaway ends at 11:59pm EST on September 23rd. You must be 18 or older to enter.